This recipe is so old and so altered, but it is from a tiny little tea room I worked at when I was young and dumb. I like because it does not have, in my opinion, too many eggs. I like a denser quiche. But the flavors of this are truly worth the work, not that there is much work involved really. You can substitute frozen spinach that is thawed or frozen broccoli that is thawed – both have to be well drained. This is great with a side salad and some homemade buttermilk ranch dressing. I happen to like a little ranch on the quiche as a counter point. I will be posting my version of buttermilk ranch soon. Making it at home is just beyond belief, but I’m not expecting really great photos — I mean, buttermilk, mayo and herbs. Sigh, more blah colors. Can’t wait for spring to truly kick in and get some colorful veggies on the plate. Preheat oven to 400 degrees. Sauté onion in a couple Tbs. of olive oil until soft. Add sliced mushrooms and cook until most of the liquid evaporates. Add Balsamic and let it reduce too. Top with washed and mostly dried spinach. Turn into pan to wilt down. And again let most liquid evaporate. It’s important to get this as dry as possible. Let cool in pan to room temperature. In a large-ish bowl, mix together beaten eggs, evaporated milk and mozzarella. Add cooled spinach and mushroom mixture and combine well. Blind bake pie crusts* I prefer glass pie plates with pie weights – for 12 or so minutes and return to oven without weights for about 3 more minutes. When the crusts are slightly cooler, divide the spinach mixture between them. Bake quiche for 30 – 35 minutes or until lightly brown on top. For many years, I was a vegetarian. I enjoyed it and I still enjoy making recipes that don’t include meat. Now, that does not mean I’m forsaking bacon or steak at this point, but I dig some veggie pasta (as long as there is cheese and cream included – I’m not crazy) or a veggie (guess I need to learn how to spell vegetable at some point – woo hoo! I did it correctly – for once, maybe) appetizer. 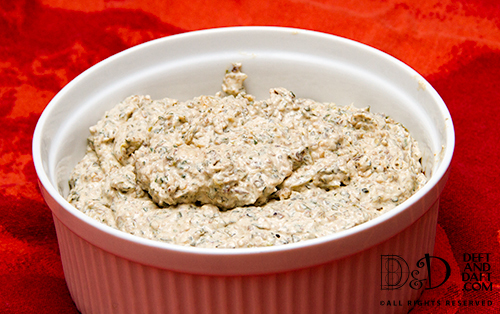 One of my favorite appetizers, vegetarian or not, is mushroom watercress pate. It’s kind of stupidly simple, but here it is. I found the original recipe out of a vegetarian cookbook that my older sister gave me for Christmas because, I’m sure, she couldn’t think of anything else for me at that point. You know that age. Heat 2 Tbs olive oil in pan, and when shimmering, add mushrooms. Cook until they have released their juices and add onions/scallions. When all is soft, turn up heat a bit and add balsamic vinegar and deglaze the pan. Add watercress and mix to wilt. In the food processor, add cream cheese in large pieces and then include the mixture from the pan. Add salt and pepper. Mix in food processor until smooth. Place in ceramic ramekin and cover with plastic wrap. Refrigerate. 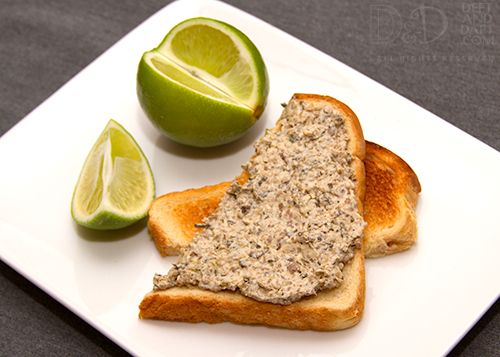 To serve, toast bread (or use sturdy cracker) and top with pate and a squeeze of lime juice (this is totally necessary and not to be skipped). The Boy grew up eating this and makes sandwiches out of it. It’s a great idea and works so well. The bitterness in the watercress is what makes it – well, that and the balsamic vinegar (which was NOT in the original recipe – yay me). It’s not pretty. I totally get that, but just try it once – really just once and you’ll be hooked. That, I know, for sure.